The Goldie series from La Palina, with a 90+ rating, is the company’s most highly praised offering from the El Titan de Bronze Factory in the Little Havana neighborhood of Miami. The availability and the expensive price tag make the Goldie difficult to obtain by the everyday cigar enthusiast. 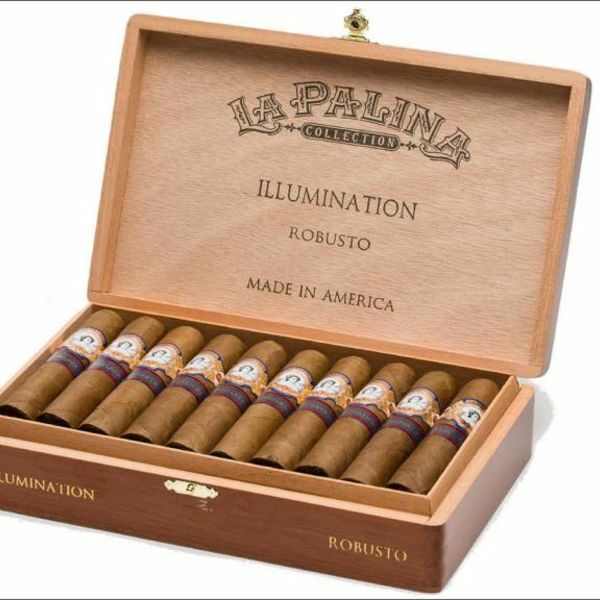 Bill Paley of La Palina had a solution and created a high quality but relatively inexpensive cigar, the Illumination. Which is also made at the El Titan de Bronze Factory. The blend is similar as well. An Ecuadorian Habano wrapper encases an Ecuadorian binder and Dominican and Nicaraguan long-fillers. The difference between the two is the Illumination includes a high priming Ligero leaf creating a spicier and heartier blend. Notes of toasted peanuts, black pepper, and undertones of citrus and earth makes this a well-balanced premium cigar at half the cost of the Goldie. Mix the ingredients together (besides the cherry), pour into a glass, and add ice. After giving it a quick stir, garnish with a cherry.